We would like to extend a thanks to all of our supportive clients, friends, staff and family members who voted for Dreamclinic in King5’s Best of Western Washington 2013 poll. We have placed 4th this year, and this being the third year in a row we have grabbed a top five finalist ranking in the poll. together to bring these services to you 7 days a week. Thank you thank you! Dreamclinic wins top prize “Seattle’s Best Massage” in The Best of Citysearch 2013! 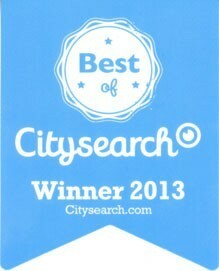 Dreamclinic has been voted “Seattle’s Best Massage” by voters s on Citysearch.com in their annual poll. This year’s selection marks an impressive consecutive string of victories as Dreamclinic was previously voted Seattle’s Best Massage on Citysearch in 2007, 2008, 2009, 2010, and 2011. The poll was not held in 2012. We are thrilled to announce being voted a Finalist for Seattle’s Best Massage as part of Evening Magazine’s Best of Western Washington Contest! We have previously been nominated for The Best of Western Washington in 2008, 2009 and 2010 polls. In 2010, Dreamclinic was voted as part of the top 10 Massage Clinics in Seattle. The incredible Dreamclinic community did it again. Our dearly-beloved clients, business associates, and staff all voted at the end of 2010 for Seattle’s Best Massage categories on Best of Citysearch and it spoke volumes! In keeping with tradition, this fall, Citysearch once again held voting for Best of Seattle in a variety of Health and Beauty Categories, including a number of massage specialties. On December 3rd, Citysearch announced the winners based on popular voting. Dreamclinic claimed first place in eight out of nine massage categories including Deep Tissue Massage, Swedish Massage, Sports Massage, Pregnancy Massage, Therapeutic Massage, Thai Massage and others. “You voted for the best Massage in Seattle, and we counted…” is how Citysearch introduced its top vote-getters in the Massage Category in 2007. And the votes put Dreamclinic at number one in Seattle.